Spec Script: Is fresher better? Would you rather spec Better With You or The Big Bang Theory? Blue Bloods or The Good Wife? I’ve recently received a few comments about the annual “Hot Spec Script” list and how it’s apparently already outdated. I’m amused at the thought of a post being stale after six months, especially something called an annual list. Has the state of television series changed so much in the last six months that an addendum–nay, a revisal of the list is required? Either the person is talking about shows getting canceled, or how some shows are outdatedly classified as mainstream or wild cards. And I’m pretty pleased to see that out of over fifty shows listed, only three have been canceled in the past six months. This brings me however to one of the core issues in picking a show to spec: longevity. Before trying to break a show, or even research it, you obviously need to choose it. Of course, each person has his/her own ability to take on a given show, regardless of the series’ age, and I’ve already talked a bit about this tricky subject. There are two aspects to longevity. The first is the fear of renewal. As Lone Star and My Generation can both attest, being on the air is one thing, getting renewed is another. Though it might have seem tempting to spec My Gen before it even premiered (what with all the billboards and whatnot), it would have proven to be a waste of time. No one can really predict with 100% accuracy if a given show is going to get renewed, you can only guess it to a certain extent. If the series has ratings and an interesting story-world, then I’d wager it will continue. The other aspect to the “longevity” issue is what is debatable, and perhaps even more important. 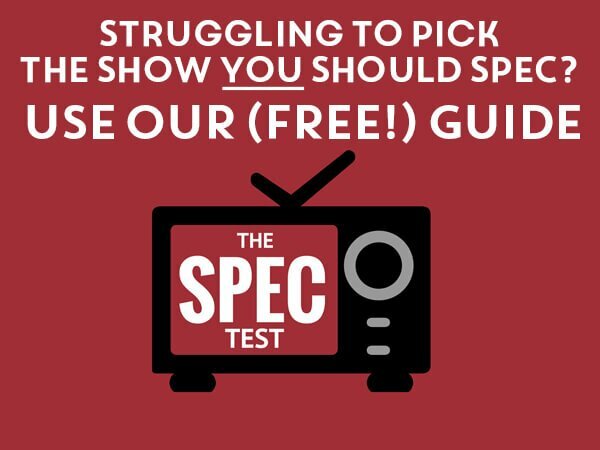 If a show has been on the air less than a full season, should you consider speccing it? Blame it on Facebook, ADD or Jersey Shore, but it seems that people are not happy anymore sticking with the “at least one season under the belt” formula. Everyone wants to “get ahead of the curve,” and the most obvious way to do it is to spec a brand new show. Is this a ground-breaking issue? Hell no. But it’s now more than ever a central one. Perhaps the best example of this situation is last season’s Modern Family and Community. Both shows had been on the air for only a few months, and already you could tell they were going to be great comedies to spec. And the fact that neither of them were renewed at that point made no difference. It was, and still is, a smart choice to try to spec them, but one key component that many people seem to miss is the fact that a new show hasn’t found its footing. Case in point with Glee. Watch the first half of season one, then compare it to last week’s episode. If you can’t see how vast the show has changed, you should reconsider speccing it. Don’t get me wrong, I’m not saying you shouldn’t think about writing a Nikita spec script. It’s always good sometimes to take mitigated risks when it comes to choosing a show to spec. But no one should feel rushed into breaking an episode of, say, The Event before it’s even renewed for a second season. The show is as speccable now as Caprica was only two weeks ago. And then look at what Syfy did. If you are going to commit several months of your life researching, breaking, and then writing a spec script for a brand new TV show that has been on the air for less time than the Chilean miners were underground, wait a bit. You need to really think things through in terms of storytelling, dialogue, structure, characters; not gimmicks. The show might not have found its foothold in the first season, let alone first two months of being on the air. It’s certainly a safe bet to say Hawaii Five-0 will soon be the go-to action procedural to spec in a few months, but until then, don’t presume that a show two seasons in, like NCIS:LA, is already past its due with no more stories to tell. I’m sure a few people are already spit-balling spec stories for The Waking Dead right now. By all means, jot down your ideas. But maybe it would be wise to hone them once a few more episodes have been shown. You know, more than one. This is tantamount to being scared of your own shadow. You’re racing against an imaginary enemy. Your script isn’t going to stand out because you are the first person ever to spec Modern Family or Hawaii Five-0. It will stand out because it is great by itself.